Here I sit, again in my happy place at the cabin amongst hundreds of beautifully mature trees, a sunny sky and peaceful breeze. Life is grand. Simple. Adored. I love this place. Last year I spent a significant amount of time here with the kids and my sister’s family as my husband was travelling a lot for work and I was transitioning from rehabilitation to base training after my injury. The combination of steady exercise and easy parenting with plenty of rest and relaxation was perfect. Everyone was happy; I could do a mix of running, swimming, cycling, and visiting with my sister while the kids could play freely all over the grounds with their cousins. It was a summer I will never forget, particularly because it started with a mere shuffle and ended with my first complete run, confirming my heart’s desire and body’s ability to go back after that 2016 Olympic marathon standard. And on April 12, 2015 in Rotterdam, Netherlands I ran my second fastest marathon ever, in 2:29:38, making that dream a reality. It was incredible. I was elated. Emotionally it took about 2 months to recover from the events of the previous year but I patiently waited until my mind and body was ready to commit to another training build. Unfortunately this meant that I had to forego competing for Canada at the July Toronto Pan Am Games and August Bejing World Championships. Naturally, a marathon six months later in October would be a perfect fit so it was a no-brainer to choose the Scotiabank Toronto Waterfront Marathon. And once again there were so many other great reasons to compete in this event: no travel, less time away from home, nearby for spectating family and friends, an IAAF gold label, a competitive field, excellent care, our national championship, and my “home” marathon. 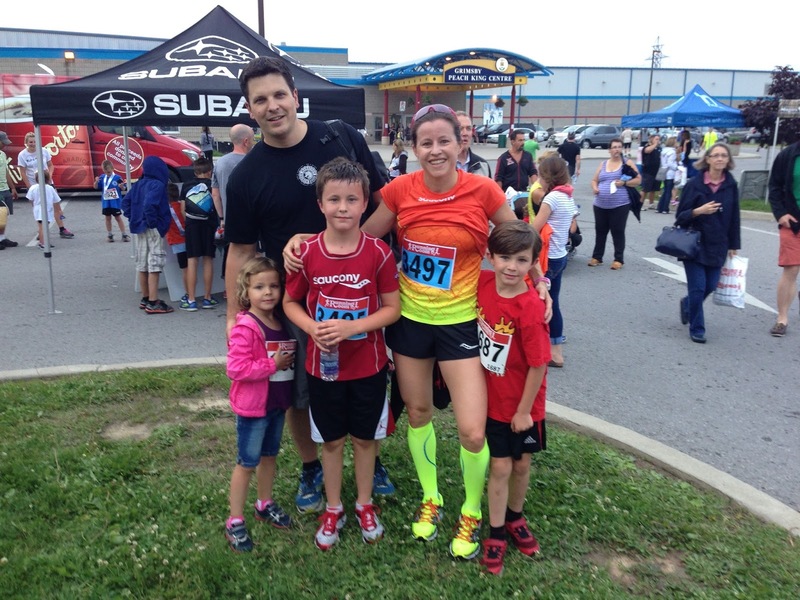 Paul Gains wrote an excellent press release for Alan Brookes and the Canada Running Series. Read it here. I am now in week four of my sixteen week build and fairly successfully replicating last summer’s positive experience, splitting time between home and the cabin. I’m back to running in the country, riding my bike in the cabin, swimming with the kids, and loving the time spent with my sister and her family. I will have averaged nearly 135 km and 15 h total training (run, bike, pool) per week for the month with the usual tempo, interval and long run sessions. I continue to take care of myself with a daily 30 minute preventative maintenance routine, and weekly physiotherapy and massage treatments. Coach Rick and I feel I am right where I need to be. On June 30 I opened my season with a 5 km rust buster race and succeeded in running a bit faster than goal marathon race pace with a 17:05, placing second overall (first woman). The Peachbud race in Grimsby was an excellent family event and it’s always so special to remember the late Race Director, Jerry Friesen. Due to some heavy traffic, we were a bit delayed in our arrival. So I did my warm up, back and forth along the 1 km fun run route while cheering for Seth and Leah who were competing. 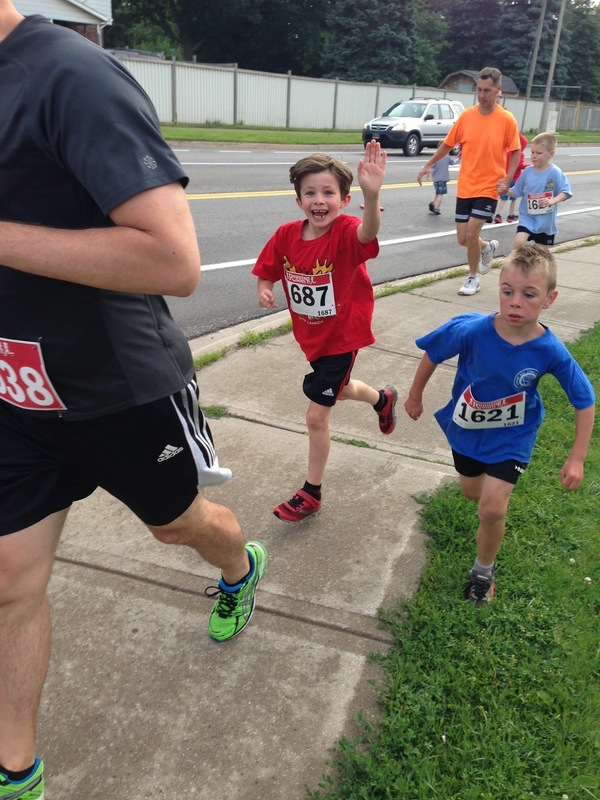 For my cool down, I switched my shoes and ran with Micah as he raced the 5 km. Jonathan was support crew for the night, cheering us on, taking pictures, carrying gear and getting us to our various start lines in time. Here we go again. Another DQ Peanut Buster Parfait before starting a new season free of sweets! Oh, it was sooooo good. 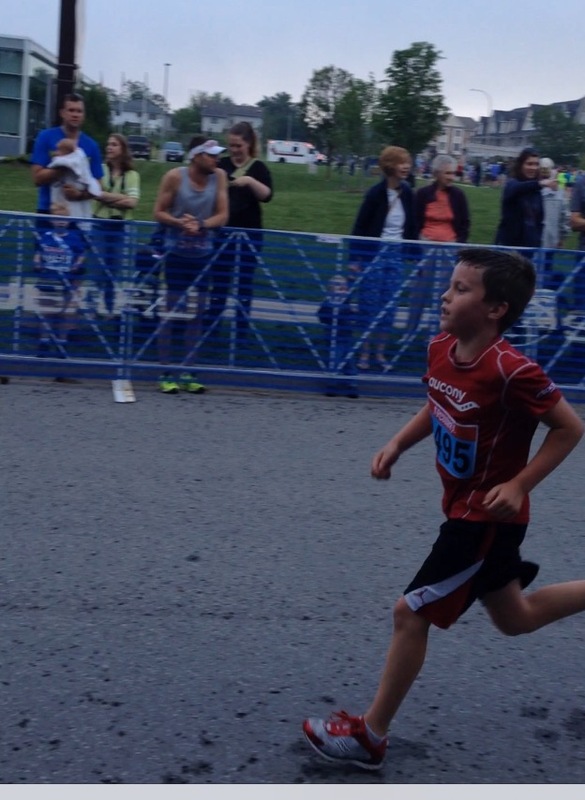 Micah nearing the finish line for a new 5 km PB of 26:48. Sporting the new Smith sunglasses. Love ’em. I’m so pleased to be partnered with them! So pleased to be part of Smith Optics. Even though I wouldn’t be participating in the Toronto Pan Am Games, I was honoured and privileged to be selected to carry the torch as part of the relay that went through Brantford on June 19. What a fun experience! It was a bit of a hectic morning because I had to train, feed and arrange childcare for the kids who would watch my part on route, and meet them in Harmony Square afterwards for the festivities. But we succeeded. With Mr. Walter Gretzky and several others from Brantford, the torch bearers were instructed in how to receive, carry and pass the torch. We did a little fun warm up to the Pan Am theme song and took pictures before loading the bus. Fortunately we got to hop off to watch Mr. Gretzky pass the torch to figure skater Mary Orr who did a short performance with her partner on the ice at the Wayne Gretzky Sports Centre. What a thrill. There were a lot of spectators in the building and it was near deafening with the enthusiasm from so many. Eventually it was my turn. The plan was to do the 2.5 km “endurance leg” at about 5 min/km but I ended up running closer to 4 min/km! I must say it felt somewhat like a race with the adrenaline and that the torch was much heavier than I thought. I had to switch arms several times, while keeping it from singeing my hair. Celebrating afterwards with autograph signing, local sport performances, music, games and other forms of entertainment made for a wonderful afternoon. I was ready for bed that night! Day 20 video here with Brantford at about 2:40. And here’s the link to the 100 Huntley Street report from the 2015 Pan Am Games, which aired July 20. They followed my story from July 2014 to July 2015. Mr. Walter Gretzky loves his Brantford. What a great experience. Photo: Sean Allen, Brant News. All Saucony at the cabin. Family. Coach Rick and I will again keep it simple with races leading up to the October 18 Scotiabank Toronto Waterfront Marathon (STWM). I plan to do the Fergus Highland Games 10 k on August 9 and the Edmonton Half Marathon on Aug 23. Until then, I’ll keep plugging away with juggling the kids and training while enjoying my wonderful surroundings.